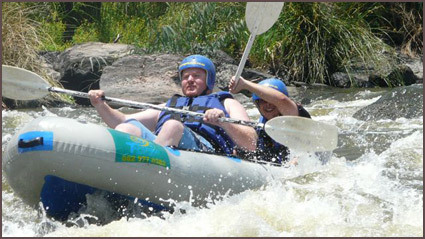 Everybody must do a multi day river-rafting trip down the Orange River. We cater for corporate, leisure, families, schools, tourists or anybody who wants to have wonderful and brilliant life experience rafting down the Orange River. Two to three day rafting trips on the Orange. Sleeping next to the river on the sandbanks is an amazing experience. If you have previously been relaxing by playing PartyPoker and want to try out something different, then you should really enjoy this. Hells gate/Douglas is the venue closest to Johannesburg for a great weekend getaway. Also on offer are Onseepkans, Richterveld and Pella. We supply everything you will need for your rafting trip down the gariep/ Orange river. Other activities also available is teambuilding, paintball, fire walking, archery, abseiling and one or two more. Contact us for more info.